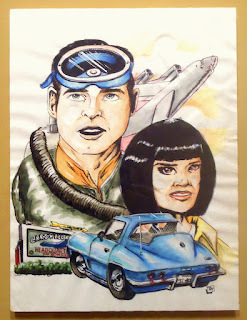 Taylor's Sweet Little Art and Nerd Site: Pin-up of the Day- 60's versions of my Mom and Dad! Pin-up of the Day- 60's versions of my Mom and Dad! Growing up, I heard a lot of stories about my parents when they first met. Those stories have always stuck with me. I would imagine what my Mom's Bahama Blue Corvette Fast Back looked like that she loved so much while holding on to my purple Hot Wheels Corvette toy car that Mom got me. And I would think of my dad in his early years in the Air Force while digging through his old uniforms and duffle bags. I would pair my curiosity of them to the tune of John Barry's opening theme of Thunderball featuring Tom Jones cause Mom said she loved Tom Jones and that was Dad's Favorite Bond movie due to the fact that it had scuba diving in it which dad loves. So this last Christmas, I really wanted to give my parents something that showed my fascination with them when they were in the 60's. I wanted it to reflect how I envisioned them back then; how I thought of my parents as adventurers. This is the piece I gave them and I think they liked it. I did a lot of research to get signs, cars, and gear as close as possible to what they had or what was available back then. The piece was made using ink, watercolor and colored sharpie. I used a thinner multimedia paper. 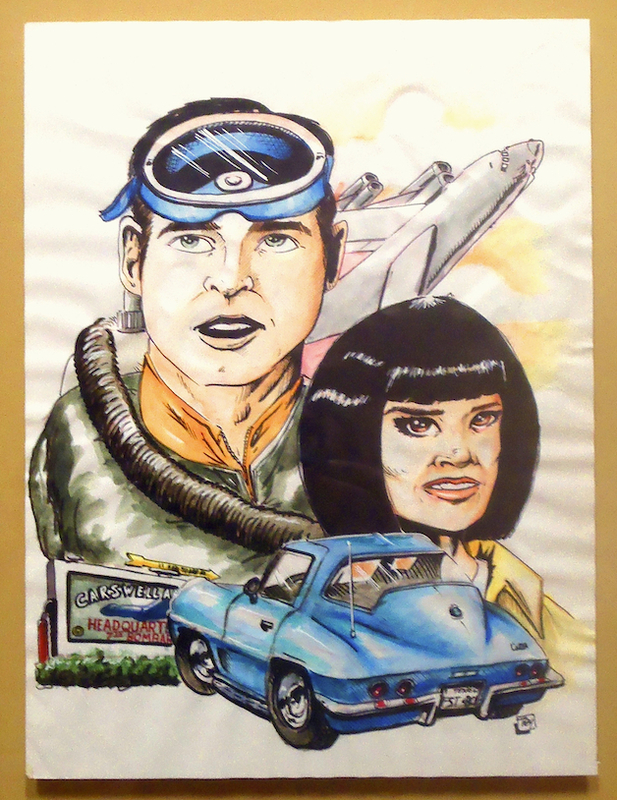 The watercolor cause the paper to bunch up a little, so the frame is now flattening the piece back down. I need to note that next time I will need to use a heavier stock of paper to do the watercolor. You can also see this piece in my deviantart gallery here. The long awaited issue 4 of Xenex the Bug Man is now up for order. It's a great looking comic book! Head on over to the Bug Man site and see what I'm talking about!